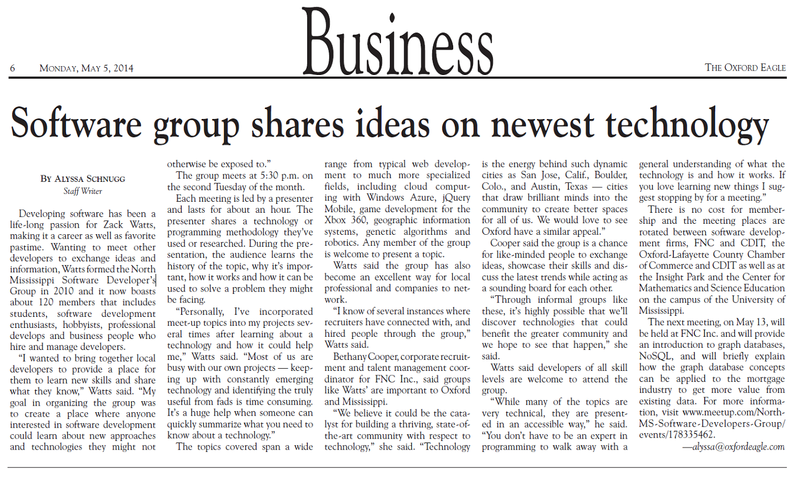 Groups like the North Mississippi Software Developer’s Group are important to Oxford and Mississippi. The group’s next meeting, on May 13, will be held at FNC Inc. and will provide an introduction to graph databases, NoSQL, and will briefly explain how graph database concepts can be applied to the mortgage industry. Where: Oxford Chamber of Commerce, 299 Jackson Avenue West, Oxford, MS (map). Park in back – come in through the door to the right of the front door.